In the past couple of weeks, severe dust storms, thunderstorms and lightning have hit several parts of India, resulting in the deaths of more than 150 people and injuries to at least 300 others. 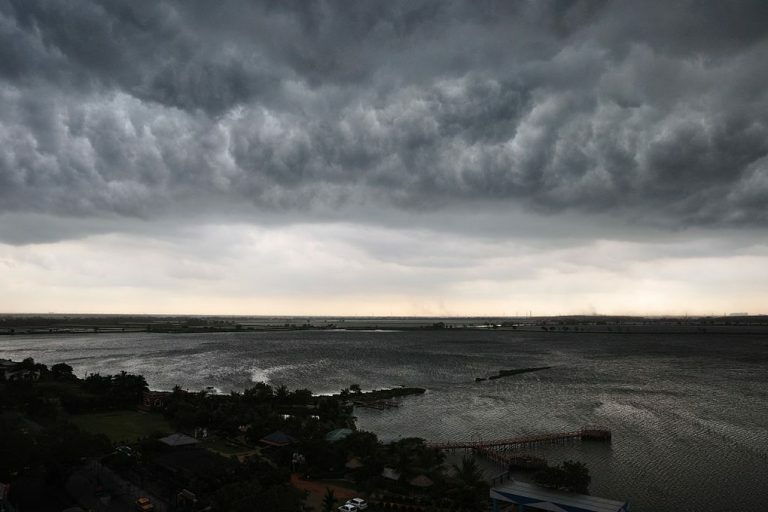 With the rise in global temperatures, the intensity of dust and thunderstorms is expected to increase in the future, experts say. But even though dust storms and thunderstorms are a common feature in India, there has been no focused work on studying the trends related to it. India could witness an increase in the severity and frequency of dust storms and thunderstorms due to rising global temperatures, experts say. “[The] intensity of sandstorms is increasing across the world,” said Chandra Bhushan, deputy director general at the Centre for Science and Environment (CSE), a Delhi-based think tank. He cited studies from the U.S. Midwest, the Middle East and the Sahara, all of them linking the phenomenon to sudden increases in surface temperature. 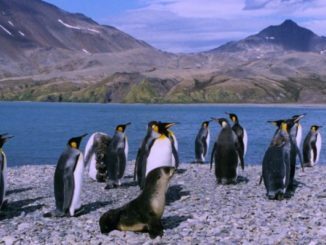 “All of them are saying that as the climate gets warmer the temperature gradient is going to become very steep. This steep increase in temperature gradient will lead to two things — heat waves and sand storms,” Bhushan said. On May 2, severe dust storms, thunderstorms and lightning hit several parts of India, resulting in the deaths of at least 124 people and injuries to 300 others. More than 10,000 utility poles and hundreds of power transformers were damaged, while farmers suffered losses to their cattle and poultry stocks. Similarly, on May 13, fierce dust and thunderstorms led to the deaths of some 40 people, while several others were injured. Bhushan said the enormity of losses from dust storms was shocking, but that they would only become more intense in the future. With higher global temperatures, he said, the soil would become drier. That will result in an increase in the amount of dust carried by the wind, and consequently the intensity of dust storms. “Climate change is intensifying all extreme weather events,” Bhushan said. The ferocity of dust storms this year was particularly severe, according to the India Meteorological Department. Image by Abhishek Meena via ust_storm_over_Aravali.jpg#/media/File ust_storm_over_Aravali.jpg” target=”_blank” rel=”noopener external”>Wikimedia Commons (CC BY-SA 4.0). 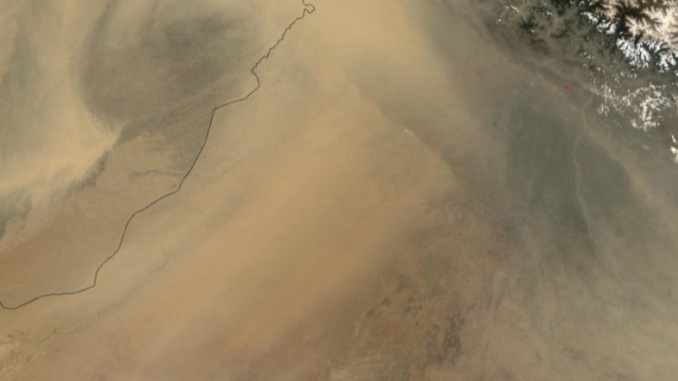 On May 2, severe dust storms and thunderstorms hit the Indian states of Rajasthan, Uttar Pradesh and other adjoining regions. In the Agra region of Uttar Pradesh, wind speeds clocked 126 kilometers per hour (78 miles per hour). Mohapatra, a senior scientist with the government-run India Meteorological Department (IMD), said dust storms and thunderstorms were the result of nearly similar weather conditions like intense heat. Areas that have moisture in the air experience thunderstorms, while those that don’t have moisture experience dust storms. Mahesh Palawat, chief meteorologist with Skymet Weather, a private weather forecaster, said the reasons for this particularly intense activity were the very high temperatures in Rajasthan and the presence of the western disturbance that led to unstable weather conditions. “Moreover, easterly winds from the Bay of Bengal were also increasing the moisture over the area. The combination of all these factors resulted in this severe dust storm and thundershower activity,” Palawat said. 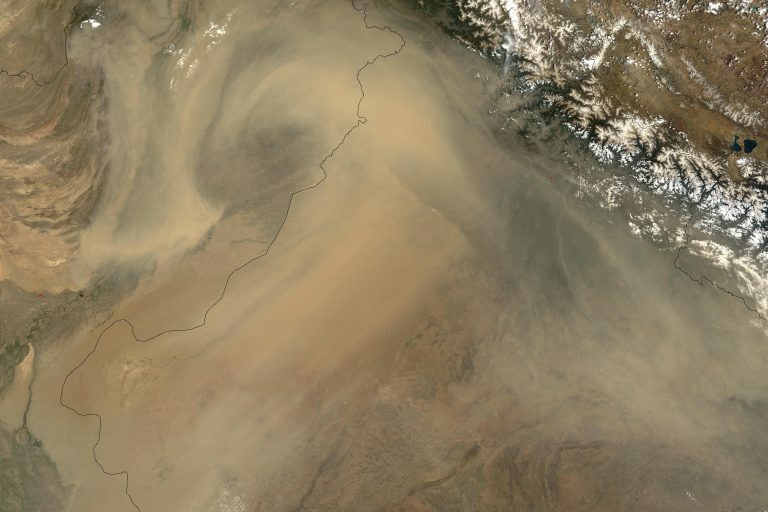 Dust storms in northwest India, especially Rajasthan state, are a common phenomenon in the pre-monsoon season. Image by Yash Harit via Wikimedia Commons (CC BY-SA 4.0). Both Mohapatra and Palawat said there was no deviation in the time of occurrence of the dust storm and thunderstorm activity as they usually peaked in the pre-monsoon period, between March and May. During this period, temperatures can go up to 45 degrees Celsius (113 degrees Fahrenheit), which can lead to these kinds of storms, Palawat said. Even as dust storms and thunderstorms are a common occurrence every year, there has been no focused study of the trends related to it, Mohapatra said. The extent of damage caused by thunderstorm activity in India can be gauged from data from India’s National Crime Records Bureau (NCRB). Compared to other natural disasters, such as cyclones, floods or heat waves, lightning kills more people in India, the data show. For instance, at least 25 percent of the 10,510 accidental deaths attributable to forces of nature in 2015 were due to lightning. That figure has held steady at over 2,000 every year since 2005. In 2015, lightning accounted for at least 25 percent of the 10,510 deaths attributable to forces of nature. Image by Hemant Banswal via Wikimedia Commons (CC BY-SA 4.0). 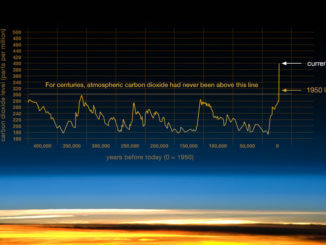 Climate change is leading to a rise in global temperature. In January this year, a report by NASA said the global surface temperature of the Earth in 2017 was the second-warmest in recorded history since 1880. The trend is continuing. According to the U.S. government’s National Oceanic and Atmospheric Administration (NOAA), the global temperature in January 2018 was the fifth-highest for that month since 1880. 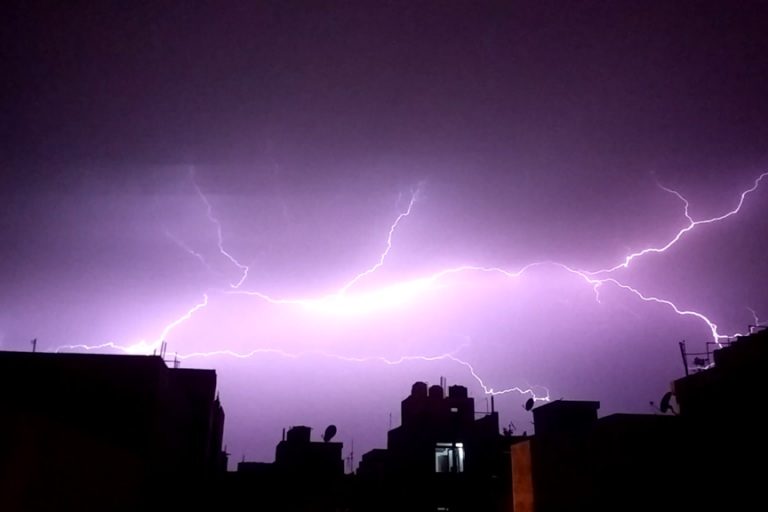 In India, the IMD says global warming could increase the frequency of storms like those that hit the north of the country on May 2. Thick clouds of desert dust were blowing over Pakistan (left) and India (right) at the foothills of the Himalaya Mountains on June 9, 2003. Image courtesy Jacques Descloitres, MODIS Rapid Response Team at NASA GSFC. Mohapatra said wind speeds during the storms were not record-breaking — 69 kilometers per hour (43 miles per hour) over Delhi, and 126 kilometers per hour over Agra — but the incident occurred over a large area and affected a large number of people. “Due to climate change and global warming, these types of weather activities are increasing,” Palawat said. “Heat wave incidents are also increasing and temperature records are frequently breaking. 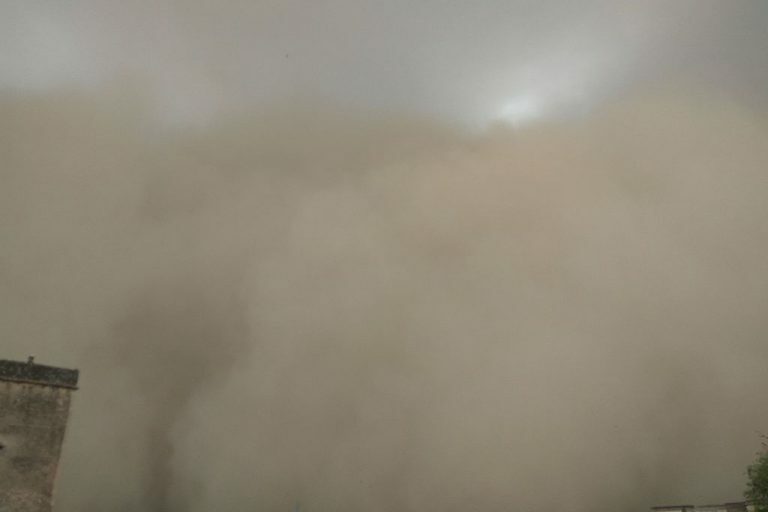 This was one of the most violent dust storm and thunderstorm over northwest India in the recent years. It was one of the most ferocious dust storms in the last decade if you go by wind speed and the quantum of destruction. 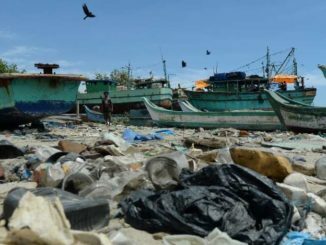 “These kinds of dust storms with high intensity will occur more frequently than what we have seen till now because of so many factors like climate change, ecological disorder, and green cover depletion,” he added. 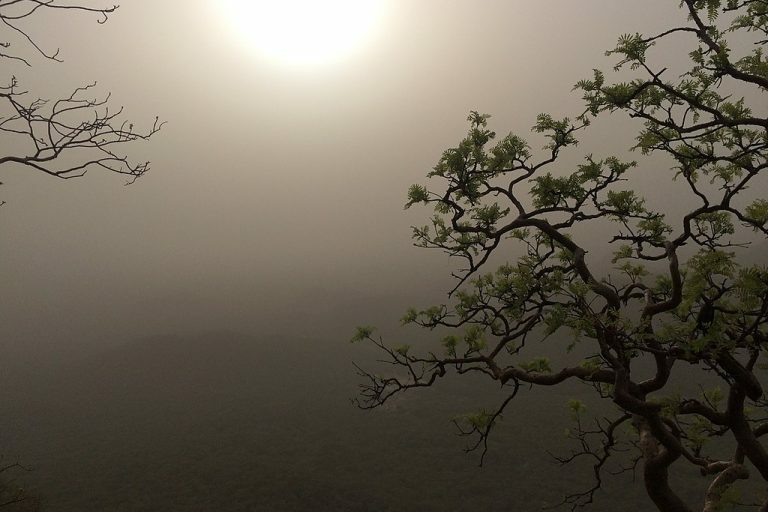 However, a study led by researchers from the Indian Institute of Technology Bhubaneswar, published in November 2017, found a decrease in dust during the pre-monsoon season over the Thar Desert in Rajasthan and the Indo-Gangetic plains in northern India, resulting in a decrease in intensity of dust storms. The IMD is yet to carry out quality research on dust storms and thunderstorms. Image by Biswarup Ganguly via Wikimedia Commons (CC BY 3.0). 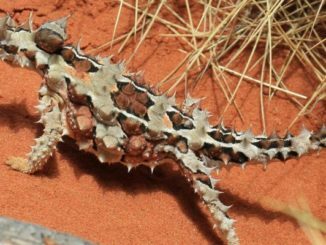 This story was first published on May 8, 2018, by Mongabay-India.